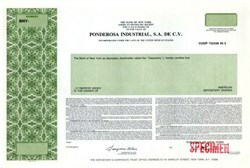 Beautifully engraved SPECIMEN certificate from Ponderosa Industrial, S.A de C.V. This historic document was printed by Thomas de la Rue and has a block border. This item has printed signatures of an authorized representative and the Company's Vice President. Ponderosa Industrial SA produces and sells wood pulp, paper, cellulose fibers, plywood, wooden panels and converted paper packaging products. The company's four main operating subsidiaries are Empaques Ponderosa, Celulosa y Papel Ponderosa, Paneles Ponderosa and Plywood Ponderosa. Packaging products accounted for 52% of 1992 revenues; wood pulp, fibers and paper, 23%; wooden panels, 16% and plywood, 9%.